"The Box set contains 24 fashion colors, package comes with instruction and ingredient. Our high-quality Hair Chalk provides your hair with everything you need to look fabulous. With this 24 pack hair chalks, You will enjoy exploring all the color combinations possible. 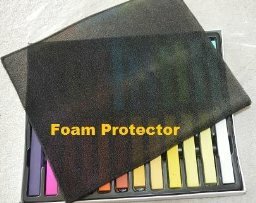 You will get a rainbow of chalks that will work on any color of hair." 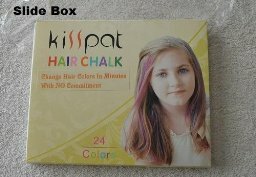 I was sent a box of 24 chalk colors from Kisspat to review. The price for this box is $15.99. I am glad to write that the box arrived in great condition. However, two of the hair chalks inside were cracked in half. The box is a slide top, and it was wrapped in tight cellophane. The box is yellow, and the top slides off from the side. When you open it, you'll find a little piece of foam to protect the chalks. I love trying new and fun things with my hair, that's why I was excited to try this! Temporary, easy, and inexpensive. I opened up the box, and was happy with the color choice. 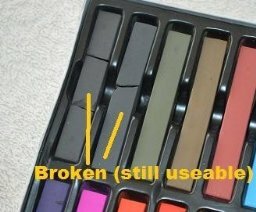 The last two chalks (charcoal and black) were cracked in half, but are still able to be used. I used pink! I love how I can control how bold or subtle the color is. A variety of 24 colors. The packaging is horrible. It is hard to restore these. I wish it came in an easier to use box. I would also recommend using a glove because the hair chalk stains your fingers. WELL—I have blond hair, and it always takes to color quite well. I haven’t had an issue ever, so I was pretty excited to try these. The directions say that you can dampen your hair or the chalk piece itself. I decided to go with dampening the chalk so I can kind of control where it touches. Now, it DOES put out color, so I’m happy with that. It is so difficult to actually apply it, though (when you dampen the chalk). 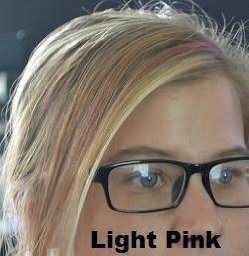 It really only works with pressure, so you end up coloring the roots, but it lessens as the length of your hair increases. The BEST way to apply this is to dampen your hair first, so don’t take the shortcut that I did. On another note, you get quite a variety of colors, but your hands will also get colored as you use these, so be sure to wash it off when you are done. At the end of the day, this washes out with your normal shampoo. I love the variety you get, but overall, I think it could use a few fixes (paper hand grips), softer formula, etc. Are you wanting to try the Kisspat Hair Chalk, too? Click the link below, and order away!